Upholstery, heavy quilts, denim, and leather are some of the trickiest fabrics to sew through. Not only do their thick weaves and even thicker height make them complicated to sew on a traditional sewing machine, but normal feeders and sewing machines can also cause bunching and even tearing on heavier fabrics, not to mention the potential damages to a normal sewing machine while stitching with heavier fabrics. That’s why it is important to invest in a heavy-duty sewing machine for those projects that can’t be taken on by your traditional sewing machine. Heavy-duty sewing machines have adjustable footers, as well as thicker needles and stronger feeders to make sure your project goes off without a hitch. However, for a true heavy-duty sewing machine, the external tools aren’t the only things reinforced. A good heavy-duty sewing machine has stronger bobbins and internal mechanics to hold up against intensive sewing projects for years to come. When it comes to stitching heavy fabrics, investing in a heavy-duty sewing machine can save you lots of frustration on projects down the line, and is an investment towards high-quality projects, no matter how unique the fabrics. A good heavy-duty sewing machine has reinforced internal components, as well as adjustable settings to allow you to take on any size project without frustration. While additional machine arm space isn’t necessary for a heavy-duty machine, it can help make dealing with upholstery projects much easier depending on your individual needs. Many heavy-duty sewing machines can, of course, be used for sewing traditional fabrics, but they may not have nearly as many stitches as a computer-guided or even a basic sewing machine. This doesn’t mean that heavy-duty sewing machines are overly basic, of course, it just means you should keep in mind what projects you may take on down the line before investing in a heavy-duty sewing machine that meets your need, both in design and fabric weight. Without further ado, here is our list of the best heavy-duty sewing machine on the market. With 34 stitches to choose from, as well as an extension table and multiple feet including a blind hem foot, zipper foot, and more, this is a good sewing machine for anyone who finds themselves sewing denim or leather on a regular basis. While the TOYOTA Super Jeans J34 Sewing MAchine can take on more intensive projects, like upholstery, as advised by one Amazon reviewer, “you really need to take it very slow and easy” thanks to the feeding system and bobbin tension on this machine. While this is a good sewing machine for anyone starting out on their heavy-duty sewing project journey, it’s slow progress makes it less than ideal for all large-scale projects. On the upside, it’s heavy-duty construction doesn’t add to its overall weight, making it a great travel sewing machine for intensive projects. TOYOTA Super Jeans J34 Sewing Machine (Glides Over 12 Layers of Denim) w/Extension Table, Gliding Foot, Blind Hem Foot, Zipper Foot, Overcast Foot, Needles and More! Comes with a Large 11.8" x 16.5" Extension Table for Larger Projects! The Extension Table matches the Toyota Super Jeans Black Color and also features a Ruler for Quick Measuring! Sew through denim, jeans and more with ease! The included Gliding Foot is found only on Toyota Super Jeans Machines and allows the user to easily glide over multiple layers of denim. Go from 3 Layers to 6 Layers to 12 Layers and watch the foot glide over all layers without missing a stitch! This machine can sew up to 12 Layers of denim without an issue! You can sew 12 Layers of Soft Denim (12oz) or 9 Layers of Soft Denim (14oz) or 9 Layers of Hard Denim (12oz). 34 Built-In Stitches including Utility Stitches, Stretch Stitches, Blind Hem Stitches, Decorative Stitches, Applique Stitches, Overlock Stitches, a 4-Way Smocking Stitch, a Triple Reinforced Straight Stitch, a Triple Reinforced Zig Zag Stitch and a 4-Step Buttonhole Stitch. The convenient stitch panel on the front of Toyota J34 shows you all the stitches at a glance with their corresponding stitch letter or number; making stitch selection that much easier! 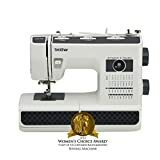 We can’t compete with the appraisal by one Amazon reviewer: “It glides through the nylon straps, like butter.” The Brother ST371HD is a heavy-duty sewing machine through and through, with durable construction and heavy-duty casing, as well as adjustable foot heights and a steel sewing plate that can take on even the most frustrating upholstery. All in all, the Brother ST371HD’s incredible price point and durable design make it a great option for anyone looking for a basic heavy-duty sewing machine. The only downside is this machine ranks in low on the stitch option side, but its durability helps balance out its basic design. Much like the Brother ST371HD, this machine isn’t winning any awards for stitch options, but it’s unkillable design and heavy-duty know-how make it one of the best choices when seeking out something to take on those projects that need a little elbow grease. According to one reviewer, “I needed it to sew through up to seven layers of mixed cloths at a time and with a little care it did the trick.” Even though you may need to go slow on this machine the quality makes up for any lost time. And this simple design makes it easy to take on the toughest projects, but might not be the ideal choice for anyone looking for stitch creativity for their next upholstery project. Metal frame, heavy-duty internals, and 32 built-in stitches make this a shoo-in for the number two spot on the list. While one reviewer noted,“ It’s not the most attractive machine, but a workhorse and can handle thicker fabrics,” the reliability and can-do attitude of this machine will make you feel love at first sight. And with b32 stitch option to choose from, this machine will have you sewing circles around most other heavy-duty machines. And as a bonus, the 25-year warranty on the Singer Heavy Duty 4432 Sewing Machine will have you falling in love with its utilitarian appearance and drop-no-stitches attitude. Jam-proof bobbin design, automatic needle threader, easy stitch and tension selection, and an adjustable foot height make this the true workhorse of the heavy-duty sewing machines. With over 100 positive customer reviews, this sewing machine is sure to be a winner for any project that needs some added power behind it. As noted by multiple reviewers, “it’s easy to thread, sees through just about anything and is quiet to boot.” But don’t let the utilitarian function of this sewing machine deceive you, it can take on simpler projects without missing a beat, and the heavy-duty feeder feet allow you to stitch through multiple layers of heavy fabrics without dropping stitches (or your patience). No matter your project, the Janome HD3000 Heavy Duty Sewing Machine rises to the challenge to help you produce beautiful projects every time. 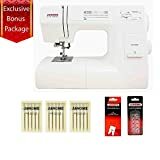 Janome HD3000 Heavy Duty Sewing Machine w/Hard Case + Ultra Glide Foot + Blind Hem Foot + Overedge Foot + Rolled Hem Foot + Zipper Foot + Buttonhole Foot + Leather and Universal Needles + More!